Provide a stable foundation for your cake / pizza and easily insert it in a box with this 12" corrugated white cake or pizza circle. Made of C flute corrugated cardboard, this durable circle supports and carries even the heaviest and most cumbersome cakes. Capable of absorbing grease and liquid, this is also ideal for serving up delicious pizza. The circle will also help maintain the pizza's heat. Even though this platform is circular, it's also great for holding square cakes. This cake circle is also rated food safe for direct contact on the kraft side making this item reversible. No matter the shape, this circle's bright white color accents your vibrant and detailed icing! Add this cake / pizza circle to your bakery, pizza shop, or market for quality support! These are good cake boards, but they are not GREASE PROOF, so if you buy these boards you will have to cover them with contact paper or some other type of covering for them to stay looking nice and clean. Other than that these are great sturdy boards. These boards came to me with lots of them bent on the edges and corners some what. Thank you for the review! We’re sorry this is not working for what you need it for. We suggest trying this Southern Champion 11221 12" Corrugated Grease Proof White Cake Circle instead. I use these boards for cakes instead of pizzas. I was a little sceptical because normally I use the grease proof but these work great. I also use them to make my owncake drums. Great price, will definitely order again! These cake circles are of good quality but I find the 12” circles too large so I primarily use the 10” circles. Bit are of the same good quality. These are great. I ordered a case to have on hand for my cake business. I used them every week and they no,d up great. I use them for single and tiered cakes alike. We use these corrugated boards for all of our cakes. We wrap them in foil and double them up for extra stability. They work great and come in boxes of 250 so they will last a while! Sturdy and nice product but I will NOT be ordering these again because they do not have a wax coating- the butter cream frosting made marks on this base. Not a good presentation when you spend hours on a cake. If you are using these for a less buttery purpose they would be fine, but they missed the mark for my use. Picture is just with the crumb coat, so hopefully I can hide the marks once I add piping. You’ll get the most out of your money purchasing these cake rounds. Being a home baker, I used to purchase these in packs of 5 and spend about $5 each time. So these are a Steal. Also I don’t seem to have a problem with grease being absorbed into the round. These cake circles are as described. White and uniformly the correct size and shape. Due to weight, I need to double the boards under my gingerbread houses. These circles stack well and appear to be one board. This product is exactly what you would expect. We use them for pizzas on our food truck. The other side is uncolored cardboard. We choose to use that side. Would purchase them without the white side if it was offered. I bought these to do double duty, one for the cakes I sell and one for the cookies I am now shipping out. a great 2 for 1 buy. use these as tier separators for wedding cakes. they are food safe and the price point works within my pricing structure. certainly a worthwhile investment. These cake circles are absolutely great. They are really thick and don't bend at all. The quality is A+ and they make your cakes look so much more professional. We use these to hold our 10" pizzas to serve to our guests. They are a good quality and hold up well. They do not bend to easily. The 12 inch cake circles work out great for my 10 inch cakes. It leaves a little bit of space so that the rim of the board still shows. I purchased these boards to use with my cakes as cake boards. Unfortunately, they are not as thick as I hoped they would be. They will still work. I love the white corrugated white cake circles! they leave all my products with the cleanest look, letting them all shine. they fit well in boxes and do not bend. I will most definitely purchase these again. These cake circles work great, I love buying the 12" because if I need a smaller one, I can just cut it down. I mostly use them for serving... I cover it with foil. These corrugated cake circles are amazing. I love the sturdiness of them. Held up great to our huge birthday cake during delivery. Will order more! This 250/case of pizza/cake circles are a great deal. These add stability to your pizza boxes and help absorb grease and oil without it soaking into the box. These 12 inch corrugated circles are great for putting under medium pizzas inside the pizza boxes. They offer additional stability and support when carrying the pizza box. Fantastic! We are using these to create a project for our VBS and they are perfect. Strong, well made and can handle being painted without warping. I realize most won't be looking at these for craft purposes, but if you are these are a great choice! These are great, pretty sturdy and a great value for the price. I use these as cake boards and make my own diy cupcake stands. A great price on a great product. We go through thousands of these things. We use them for our wood fired pizzas, and for pies in our bakery. Highly recommend. I use these not for cake, but for putting in the bottom of pizza boxes so the oil doesn't go through the box. Fit well in eater 12x12 or 14x14 boxes. The price on these 12" cake circles really is unmatchable. These boards work really great when doubled and rimmed with ribbon to create a fancy cake board. Use these for presenting, resting, and boxing our cookie cakes, and breakfast bread cakes. Just sturdy enough not to falter when moving, and just the right size for our 10" cakes with a bit of room on the edges. I use these 12 inch boards for several cake sizes. I always wrap at least 4 together for a nice tall "cake drum". I have gone thru several cases and have never had any issues. We ordered these by mistake - great price for a NON WAXED circle. We need the grease proof waxed and these were noticeably dull in comparison to our others. We sent them back. Great if you don't need them for cakes. I brought the big 250ct case of cake boards. They are nice and sturdy. I plan to use them stacked to make cake drums and wrap in nice paper/foil. But also as single use. These are at a price you can't beat. You can use them between cake layers or as actual cake boards. For larger cakes stack 3-4 together for a quick made cake drum. These cake circles are great. They are good quality and look very professional. They are perfect for my 11" tarts. The price is great for the quantity. Very nice corrugated pizza circles. They really hold up very well. I have bought a lot of these and i have used a lot of them from other venders but these are the best. Before I found coated/waxed/laminated cake circles, I used these. They work well but will absorb moisture from your cakes and the butter/fat will soak through. I suggest only using these if you plan on covering your boards with foil or some other type of food safe covering. Works well if wrapped completely in foil and used as a cheesecake board. These cake circles are very study and a great size. However, they are not coated with anything and get grease stains on them from the cake. These are perfect to serve cakes. I typically stack two or three depending on the weight of the finished cake, cover the top with contact paper and seal,the sides with electrical tape. Quick and easy you have a beautiful custom cake drum for a fraction of the bakery store prices. It's a great product, however this particular item is not grease proof, I ordered the wrong kind but that's no fault of the company. I use 2 of them because my 9 inch cakes are 3 full layers and quite heavy and they support them very well. These 12" cake circles are basic, not grease proof, but do the job. I use them as covered cake boards, and also doubled up as cake drums. HEAVY ENOUGH FOR ANY CAKE OR PASTRY. CAN USE FOR 12'' CAKE OR 10'' ALLOWING LOTS OF ROOM FOR DECORATIONS. EASILY WIPES CLEAN ANY DRIPS. These boards are great and durable. I create very heavy cakes and they are very heavy duty! Great buy! Great buy for the price! Thumbs up! The 12" corrugated boards are super for my 10" round cakes. Very sturdy and stackable for cake bases. Very reasonably priced as well. I recommend them highly. A necessity for any full-service bake shop, cake boards make it easy to move product without damage. Our customers appreciate being able to grab cakes easily from boxes without worrying about messing up the final product, and these are sturdy and inexpensive. These cake circles are perfect for everything I need. Wrap single circles for one tier, or double up the boards and wrap them with cake foil for larger cakes. 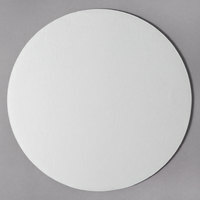 We use these circles for our large layer cakes and for wedding cakes. To display a 2-tier cake, we wrap two of these boards together with decorative foil to increase stability. These have come in handy so often and the sturdiness of them is fantastic. Will definately be ordering more during my holiday cake baking season. Great quality at a really great price. We use to package our quiche. Fits well inside a 14" bakery box. Will definitely order from webstaurant again. I love these cake circles they do just the trick for cakes that are 9" and bigger. Very sturdy excellent price and they come in nice quantity! Simple and inexpensive base for any small cake. We use it for seperating cakes while we are trnasporting them as well. Gives you the needed stability with baked goods. Great for all our cakes. We use them as cake separators. We also use them as bases. We tape 3/4 boards together and then cover them with fancy foil. These are excellent cake rounds and they come at an excellent price! We use these rounds daily and they have not once performed exceptionally.I highly recommend this product. Excellent price for the number that you get. I have been very impressed with them, especially since this is a size that I use often in my bakery. They are sturdy and hold up very well. This is a great cake round that is sturdy. I use this when cake decorating and cover it with decorative paper when packaging cakes. I highly recommend. Very sturdy and affordable. I definitely would recommend this item to others. Website has great items and great prices. Shipping is very fast and affordable. Our baker loves these. A 12 inch cake circle gives us enough space to make a great cake to serve about 15 people. The cake circles hold up very nicely as well. I used these with the 12" cake boxes, and I love it. They fit perfectly in the box, and the white top goes well with the white box. Holds a moist cake for three days without needing a piece of round parchment or doily, which is better than most cake circles I have used in the past.